Nicole Dextras, an environmental artist working in a multitude of media including sculpture, interactive public installation and photography, has created the most beautiful typographic ice sculptures. Each letter is formed by massive wooden frames, which are pumped with water and then left to freeze for two weeks. Afterwards, the ice is revealed as the frames are removed. Check out all of the photos of View, or take a peak at the entire series: Resource, Legacy, Signs of Change, Municipal Mind, View Points and In/Flux. 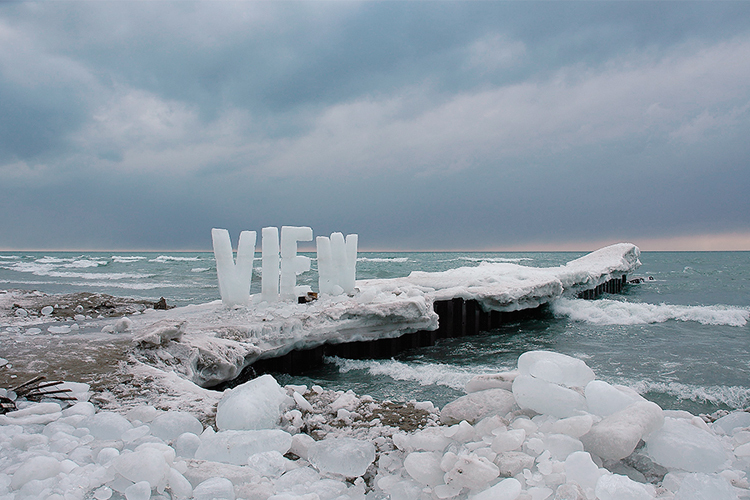 The Ice Typography series consists of three-dimensional words fabricated in ice placed outdoors that speak to how the viewer’s gaze frames and informs the landscape. The installations have varied from 8-foot high ice letters on the Yukon River to 18-inch high letters set in downtown Toronto. When the ice texts are installed on site, the temperature determines how long it will take for them to change state from solid to liquid. This phase of transition becomes symbolic of the interconnectedness of language and culture to the land as they are affected by time and by a constant shifting and transforming nature.